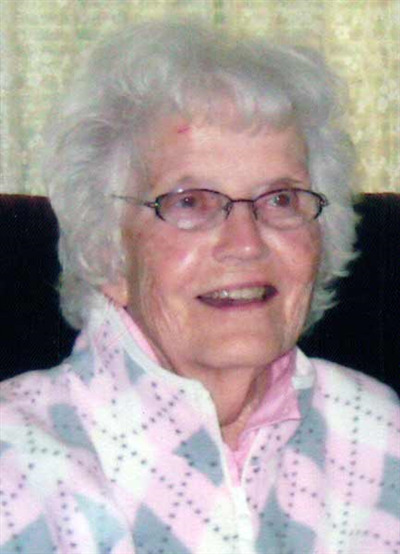 She was born on Jan. 25, 1929, in Van Wert County, Ohio, the daughter of the late Floyd Strickler and the late Nellie (Stetler) Strickler. She married Deane McMillen on Nov. 20, 1947, and he preceded her in death on April 7, 2013. She had previously attended Praise Point Church in Willshire, Ohio. Hazel was a homemaker. She was a great cook and loved growing flowers. She enjoyed watching the Chicago Cubs and IU Basketball. Survivors include four sons, Terry (Beckie) McMillen of Rockford, Ohio, Tim McMillen of Willshire, Ohio, Mick (Julie) McMillen of Convoy, Ohio, and Tony (Kelly) McMillen of Fort Wayne, Indiana; daughter, Teresa Bishoff of Pleasant Mills, Indiana; sister, Adeline Lough of Decatur, Indiana; seven grandchildren, Betsy Schoenleben, Kelly Sipe, Andy McMillen, Courtnee McMillen, Lindy Bilimek, Stephanie Bilimek, and Megan McMillen and 13 great-grandchildren. She was preceded in death by three brothers, Lester, Harold, and Floyd Strickler and three sisters, Irene Hoverman, Lois Funk, and Rosella Sovine. Funeral services will be held at 10:30 a.m. Monday, April 15, 2019, at the Zwick & Jahn Funeral Home in Decatur. Interment will follow in the Willshire Cemetery in Willshire, Ohio. Friends will be received from noon to 4 p.m. Sunday, April 14, 2019, at the Zwick & Jahn Funeral Home in Decatur. Preferred memorials can be made to the Wren-Willshire EMS. Arrangements were handled by Zwick & Jahn Funeral Home in Decatur, Indiana.